We have the facilities on-site to examine a wide range of samples to aid in the diagnosis of your pet's condition. 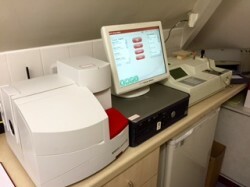 We can perform haematology [blood cell counts], biochemistry [for example liver and kidney values] We have an ISAT analyser for looking at blood electrolyte levels and a Glucometer for instant blood glucose readings. 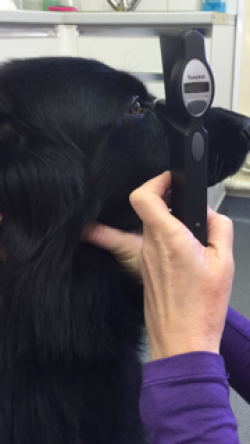 We can perform microscope examinations of skin and hair samples and urine examinations which all aid a speedy diagnosis of your pets' condition. An X-ray is an image (picture) acquired using small amounts of radiation sent through the body to create a picture. Our facility at Kidderminster is digital, which means that the images are display on a computer monitor instead of the standard film of years past. It is not only used for the diagnosis of fractures of bones but can be used for abdominal images e.g. to check for foreign bodies in the stomach and intestines. Soft internal organs such as the liver, spleen, kidneys and bladder can also be monitored for size, position and shape. Bladder stones are regularly recognised. The size and shape of the heart, and the condition of the lungs can be monitored. The presence of fluid in the chest can be observed. In many cases x-ray machines are not portable, although the one we use at our Stourport surgery is, and can be taken out to farms and stables. Unlike an x-ray machine the ultrasound scanner is readily portable. It shows us an image of the internal organs through a monitor. It is exactly the same type of scanner which is used to check the progress of babies in the womb. When used by a skilled operator it is very good for examining soft tissues within the body e.g. pregnancy diagnosis and investigating growths and swellings within the abdomen. The ultrasound scanner is particularly useful when investigating and monitoring tendon injuries in horses. A tonometer measures the pressure within the eye and is a useful aid in the diagnosis of glaucoma . The small probe gently touches the eye and the machine measures the pressure. There is no need for anaesthetic. 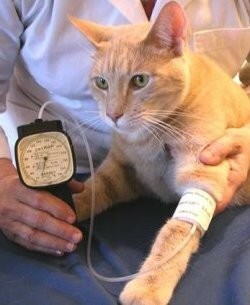 High blood pressuer is a common problem in our patients, especially in aged cats who may have thyroid or kidney disease. Having high blood pressure may lead to serios problems such as acute onset blindness or "strokes". It is important to be able to read our patients blood pressure in the clinic. This is generally done using a cuff, similar to that used in children, and a blood pressure device. The stethoscope or auscultatory method used in people cannot be used in dogs and cats; instead, the pressure must be determined with either a Doppler flow device or an oscillometric device. Pets can have an "artificially" elevated blood pressure if they become excited or stressed. Accordingly, we make repeated measurements of blood pressure before making a diagnosis of hypertension. This involves freezing small areas of the skin using liquid nitrogen. The tissues are 'frozen' in the area to be treated and allows rapid removal of small skin lumps. It can be used for treating superficial growths, growths which are difficult to remove surgically due to their position on the body, or small growths on patients that need to avoid an anaesthetic. This specialist piece of equipment measures the electrical impulses of the heart. 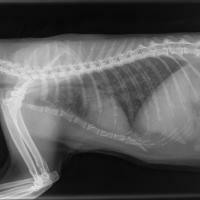 Special electrodes are connected to specific points on the pet's body and a the veterinary surgeon can then interpret the wave-pattern produced to diagnose a variety of heart conditions. The procedure is usually performed without the pet being sedated. The endoscope is a flexible tube with a light running down the centre. It is extremely useful for directly observing the throat, larynx, air ways, oesophagus, stomach and intestines. Endoscopes have the huge advantage of allowing the operator to examine 'hidden' parts of the body that are not normlly accessible. Horses may be sedated for the procedure, but cats and dogs require an anaesthetic. Both of our Surgeries are fully computerised, so that any member of staff can instantly access your pet's details. 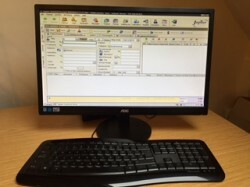 The computers at our Kidderminster and Stourport surgeries are linked so that we can access all records at either of our surgery sites. We use a variety of anaesthetic techniques in the practice tailored to suit the needs of the individual patient. These range from local anaesthetic, through light to heavy sedation, and then for more major surgery general anaesthesia is required. We routinely follow a 'Gold Standard' anaesthesia protocol. This involves the use of an effective pre-operative sedative and pain relief injection, followed by an anaesthetic injection and routine intubation (passing of a tube into the airway) and the administration through an anaesthetic machine of inhaled gas called isoflourane together with oxygen. Trained nurses monitor the anaesthetic throughout the entire operation and afterwards until the patient is awake. Because the patient is intubated with an endotracheal tube exact oxygen and anaesthetic gas flow rates can be adjusted to requirements as they change. All patients receive a peri-operative pain killer as routine. The oxygen gas is piped throughout the building directly into our gas machines. Oxygen is therefore available for emergency use in all our operating theatres, x-ray rooms, preparation rooms and isolation kennels. All our general anaesthetic cases including our neutering procedureds receive intra venous fluids throughout their operation. This allows us to maintain the patient's blood pressure and gives our patients a smoother recovery. Our anaesthetic protocols ensure that your pet is kept as safe, and as stress and pain free as possible. This is an indispensable tool. It actually works by producing sound waves, which disintegrate the damaging hard tartar, which builds up on your pet's teeth. The sound waves are of a very high frequency and remove the tartar but leave the tooth enamel intact. Manual breakdown of the tartar was laborious, time consuming and could damage the enamel of the teeth if done too enthusiastically. The dental machine is also used for drilling, scaling and polishing.